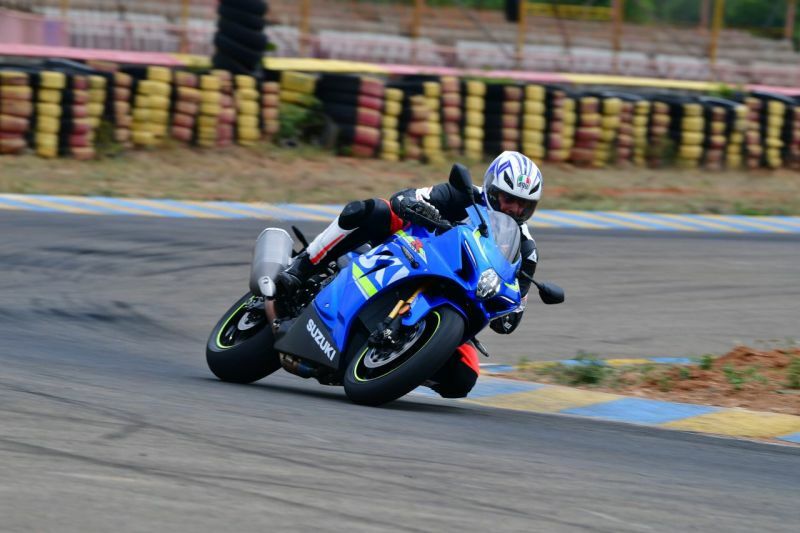 Following the launch of the 2017 GSXR1000, Suzuki invited us to the Kari Motor Speedway in Coimbatore for a first ride. As I walked into the pits, two spanking new black and blue GSXR1000s were waiting for us. The first thing that struck me was how these motorcycles have shrunk in size. The standard GSXR was the black bike and the blue was the R version. Both looked stunning but the blue was the better looking of the two with golden remote reservoirs on the front forks. 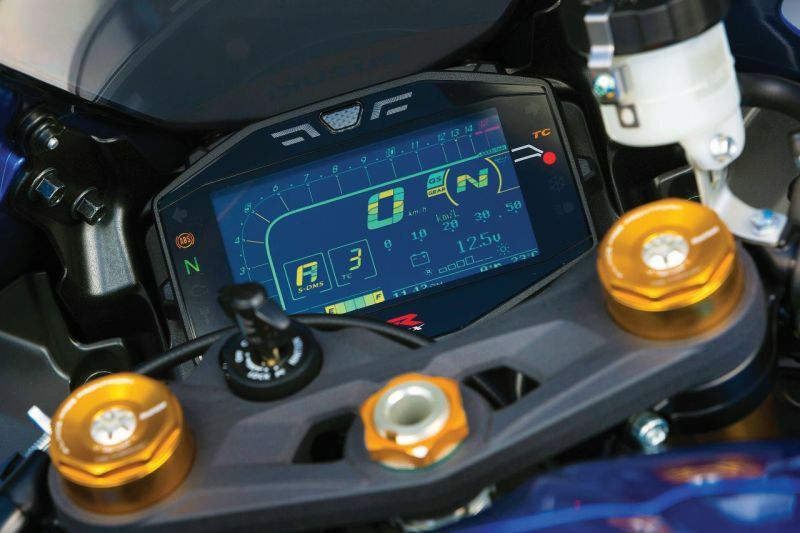 Once Suzuki released the GSX-R’s specification along with vital statistics showing a maximum output of 202 PS — an increase of 17 PS — and a slightly reduced kerb weight figure of just over 200 kg, along with the all-important addition of ride-by-wire throttle control plus an Inertial Measurement Unit with its associated potential for traction control, cornering ABS, and other electronic trickery. That extra horsepower comes from a new engine with shorter-stroke dimensions and some clever touches of its own, notably the MotoGP-inspired SR-VVT, or Suzuki Racing Variable Valve Timing. This equips the intake cam sprocket with a device containing a dozen steel balls, which are located in slanted grooves and move under centrifugal force at high revs, rotating the sprocket and retarding the timing to boost top-end performance. Other engine mods include a higher compression ratio, new valve operating system (finger followers instead of bucket tappets), and removal of the balancer shaft. There’s a reworked SRAD ram-air system, with larger ducts allowed by the slimmer LED headlight, and a new intake system with innovative two-part velocity stacks for the outer two cylinders. 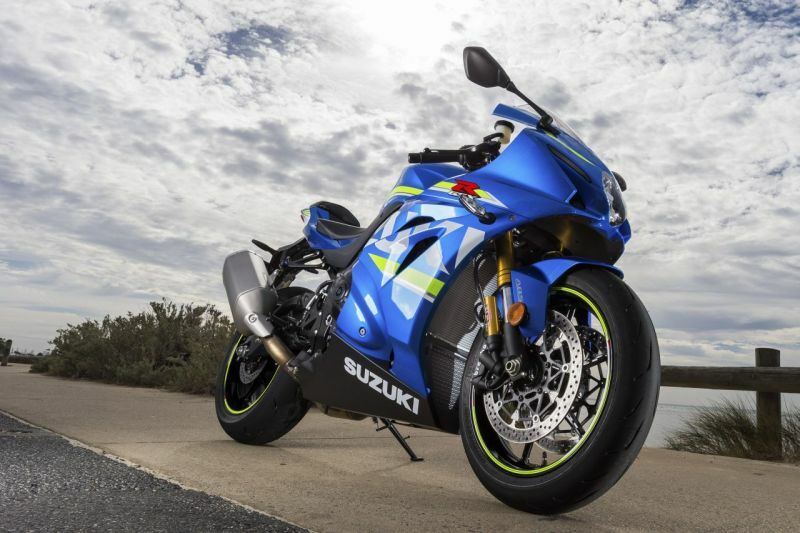 The new exhaust features Suzuki Exhaust Tuning-Alpha: rev-dependent valves in the pipes connecting downpipes of cylinders one and four, and two and three. Both models also get 10-way adjustable traction control plus three riding modes, all giving full power with different rates of throttle response. 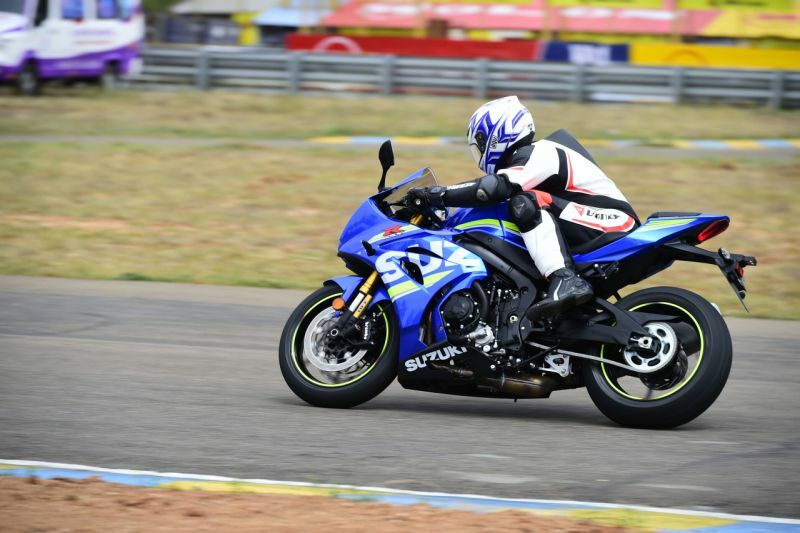 The GSX-R1000R also comes with the two-way quick-shifter. From the fairly tall saddle the view was of a new LCD display, clip-on bars and a cut-away top triple clamp holding broad, gold coloured Showa fork-tops. The motor fired up with a single jab at the starter button, and the bike pulled away easily with the help of Suzuki’s Low RPM Assist, which adds revs if necessary as you let out the clutch, whose action is light thanks to the new Suzuki Clutch Assist System. The all-new frame, whose aluminium main spars are now pressings in MotoGP fashion, also comes with cut-down side supports. The frame is 20 millimetres narrower and 10 per cent lighter as a result and holds the engine six degrees more steeply, which allows it to be closer to the front wheel, moving the centre of gravity forward to aid front-end feel. The bikes were brand-new and their tyres were not even scrubbed. I decided to ride the standard bike as I had to take it easy for a few laps to scrub the tyres before upping the pace, and that suited me just fine as this was the first time I was riding on this racetrack.